Pub in Haggerston, also a DJ and live music venue. This single-room pub retains many features of its previous life: wood-panelled walls, a stained-glass gantry above the bar photo, and dimpled windows. However, in the latest incarnation of the pub (reopened in late 2011) these are joined by a DJ deck photo and a set of traffic lights mounted on one wall. There's also a live music venue in the basement, accessed via a door next to the bar. 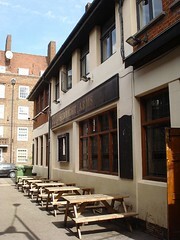 Outside seating is provided by half a dozen picnic tables in the alley alongside the pub. Kake and bob visited on a Sunday lunchtime in September 2013. We were the only customers when we arrived shortly after their noon opening time. Chillout music was playing, not too loud for conversation but loud enough to be a little distracting. The handpumps offered four real ales, one cider, and one perry: Hackney Brewery Golden Ale, Five Points Hook Island Red (£3.70/pint), Late Knights By The Dawn's Early Light (£1.85/half), Redemption Hopspur, Sandford Orchards Devon Scrumpy, and Ross On Wye Cider & Perry Co Traditional Farmhouse Perry. They also had keg taps for beers from Meantime and London Fields breweries, and a board on the wall photo listed a wide selection of bottled beers. A pint of lime and soda was £1.20. As of September 2013, food is provided by Lucky Chip. It consists of burgers and hotdogs, and is served 6pm-10pm Mon-Sat and 1pm-6pm Sun. Accessibility: A step at the front entrance, and another inside to get to the bar. There's no step at the side entrance, but again there's an internal step to the bar and then another to the seating. The music venue is in the basement. Last visited by Kake and bob, September 2013. Opening hours taken from sign outside, September 2013. Last edited 2015-09-12 14:09:49 (version 3; diff). List all versions. Page last edited 2015-09-12 14:09:49 (version 3).